Scutum. © 2003 Torsten Bronger. Scutum (abbreviation: Sct), the Shield, is a small southern constellation, one of seven added by Hevelius, which honors the Polish king John Sobieski for his defense of Vienna in 1683. Scutum lies southwest of Ophiuchus and southeast of Aquila, 10° south of the celestial equator. Its brightest star is Alpha Scuti (visual magnitude 3.85, absolute magnitude 0.21, spectral type K2III, distance 174 light-years). It also contains the prototype Delta Scuti star and the yellow giant variable R Sct, an RV Tauri star that varies semi-regularly between 5th and 8th magnitude. 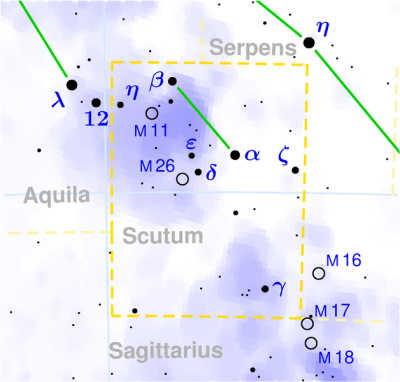 Although faint and the fifth smallest constellation, Scutum occupies an interesting part of the sky, rich in star fields of the Milky Way. It is home to two particularly attractive open clusters: the Wild Duck Cluster (M11) and M26 (NGC 6694), a compact grouping (magnitude 8.0; diameter 15'; R.A. 18h 45.2m, Dec. -09° 24').